Don't let the cutesy-pie screenshot fool you, this game might be worth watching. 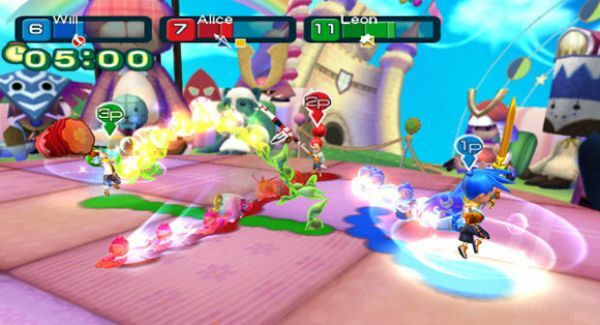 Nintendo has announced that Line Attack Heroes is being developed for the Wii. Developing the game, described as a "fast paced melee action", is Grezzo Games, which was founded by Square Enix alum Koichi Ishii. The gameplay seems quirky, for sure. The player will face waves of enemies, and when they are defeated, they join the character's army, and he can use their abilities. Players must use different attack strategies to conquer the various bosses. For example, one attack sends the line of warriors spinning toward enemies in “crack the whip” fashion while another shoots them all forward in a straight line. Line Attack Heroes requires players to think fast and strategize when choosing their heroes and assigning their formations. Page created in 0.6183 seconds.